SPRING IS ALMOST HERE!!! Just a couple more days until this long winter officially ends. Let’s hope the weather gets the message. So far this week, so good. This time of year is bittersweet for me. I absolutely love spring. It feels like a fresh start in so many aspects of life. We finally shed the cabin fever (and the extra insulation that comes with it). Flowers bloom. The days are longer. There’s more motivation to be productive and active. It’s all good stuff. I do, however, miss the bunkered down nature of winter. I love fires roaring in the fireplace, dogs cuddling on my lap, seemingly endless bottles of red wine, and pots of hot and hearty dishes bubbling away on the stove. It’s all very comforting. And as much as I crave spring this time of year, I’m always a little sad to say goodbye to those nice long weekends of hibernating…which have been especially wonderful with a new baby in the house. I don’t know that I would have wanted it the same way if it was summer. Winter gives you a good excuse to sit around and veg, and that is OH SO NECESSARY with a newborn. I think I would feel more stressed/pressure to participate in life if I had the baby in the summer? I already had a hard enough time turning off my type A personality tendencies when there was nothing to do but cuddle on the couch all day because it was FREEZE-YOUR-FACE-OFF cold outside. With all that said, I’m celebrating spring today with this awesome seafood dish. It’s full-on destroying those winter doldrums. 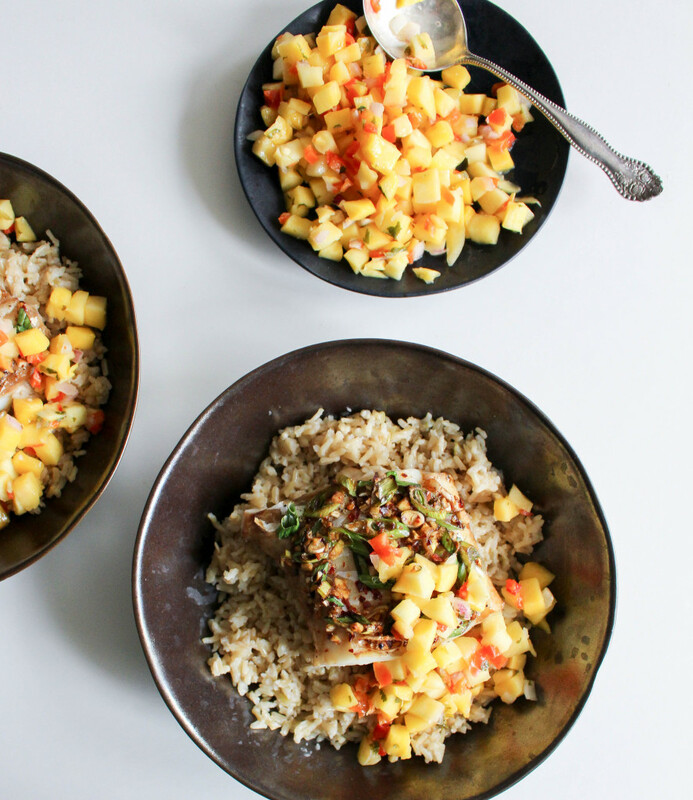 It’s light, flavorful, healthy, and topped with a springy salsa of fresh mango! Winter doesn’t stand a chance. Cod is one of those fish I can get year round without breaking the bank. It’s meaty, flaky texture is fantastic, and it’s mild enough so that you can pretty much make it any way you like. I went with an Asian theme for this one. Lots of soy, garlic, ginger, and some heat from red pepper flakes. 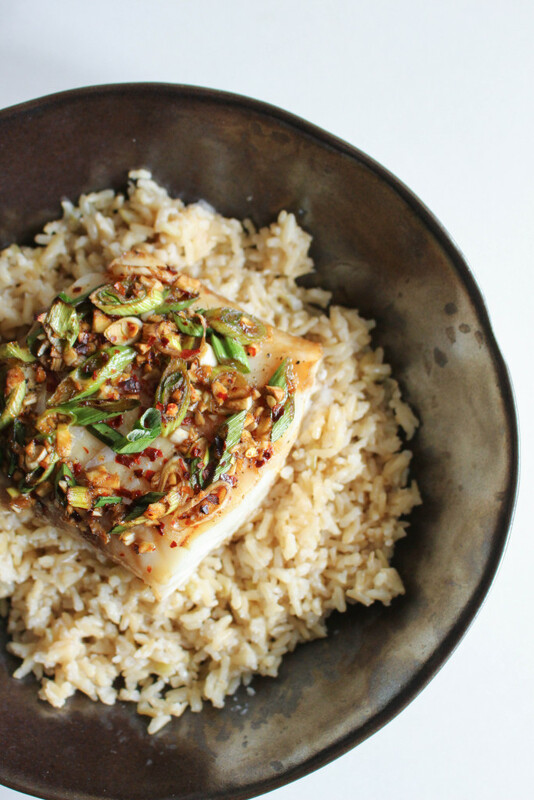 And let’s not forget the toasted sesame oil. I am obsessed. I would wash my hair with it if I could. So awesome. 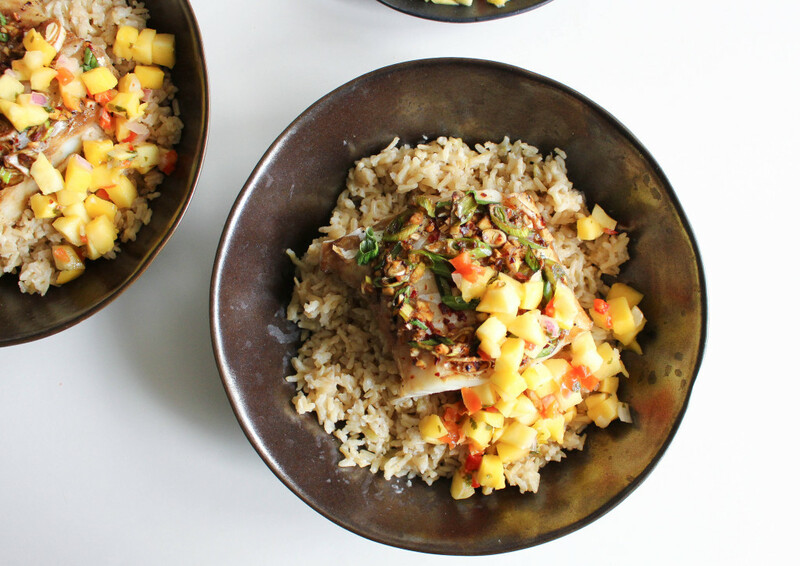 I highly recommend that you take this perfectly-cooked-foolproof fish and serve it over creamy coconut rice (which deserves a gold star in the flavor department) and topped with fresh mango salsa…and you’ll be happy to see winter go. 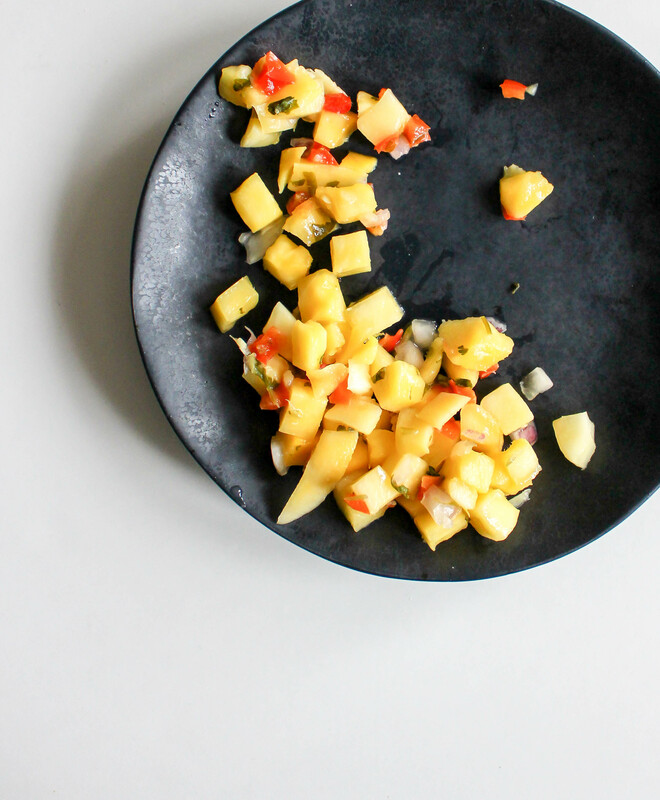 Combine all ingredients in a bowl, mix well, and season with salt and pepper. This can be made ahead (and gets better the longer it sits in the fridge!). Heat a saucepan over medium-high heat and add rice, coconut milk, coconut water, sugar, and salt. Stir, then bring to a boil. Reduce the heat to low, cover and let cook for about 30-40 minutes (or according to package directions) until liquid is absorbed. Fluff with a fork and then stir in coconut oil. 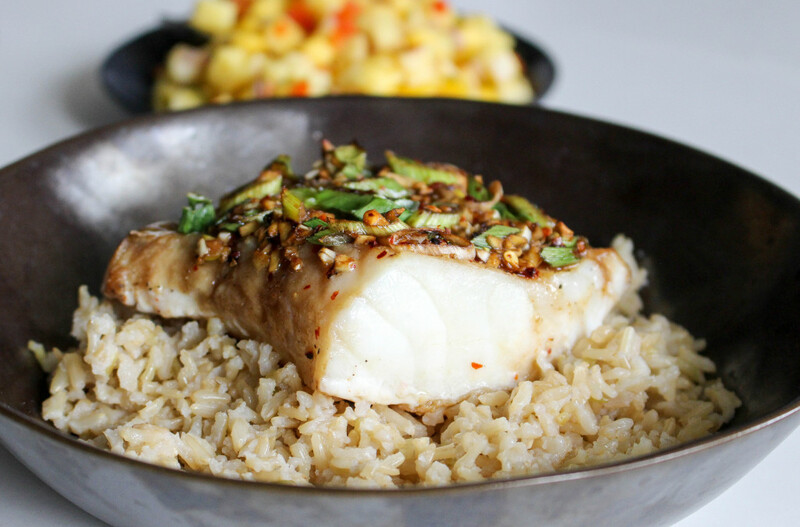 Preheat the oven to 400°F and place the fish in a small baking dish. Whisk together the other ingredients and pour over the fish. 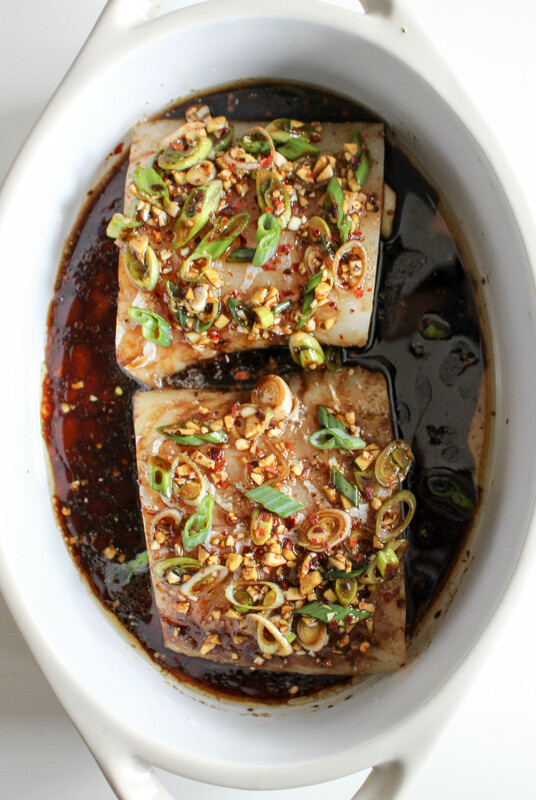 Let sit at room temperature in the marinade for about 15 minutes. Then, bake in the preheated oven for 15-20 minutes, or until the fish is flaky and cooked through (actual cooking time will depend on your oven and size of your fish fillets). 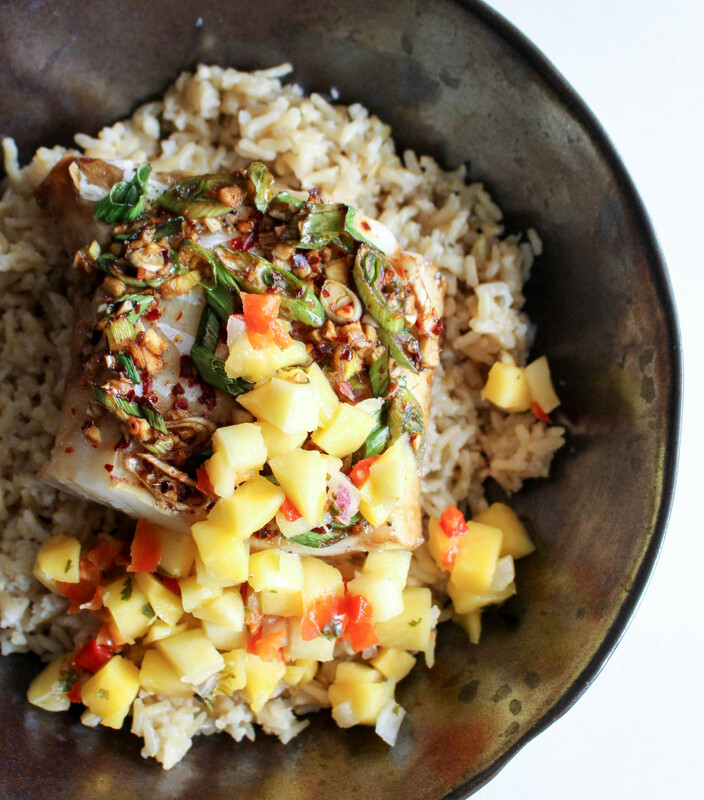 Place the rice in bowls, top with the fish, a drizzle of the pan juices, and then top with the mango salsa. Serve! Coconut rice recipe adapted from here. Made this tonight and it had the perfect flavors for a springtime meal!